After 7 long months, I finally went and got a professional pedicure. SO needed! I even picked a summery shade (Essie Haute in the Heat). I’ll spare you you a picture of my feet though. Because the internet does not need any more feet pics! We had our friends Adam and Khusbu over for dinner on Saturday night. I made a simple Asian stir fry and Katie’s chocolate chip blondies. A&K brought the beer and wine. Speaking of which, if you’re looking for a fruity Pinot Noir, check out Mirassou Winery’s 2012 Pinot. It was delicious! As usual, we had a blast eating and talking. Can’t wait to see them again soon at our friend Sweeti’s wedding in Detroit! That was my weekend in three concise bullet points. Ok, so about these muffins. I came across the recipe while cleaning out a recipe folder I’ve had forever (I told you nothing was spared!). Unfortunately, I have no idea who to give credit to for these tasty muffins. The recipe I found was handwritten on a scrap piece of paper. I did end up making a few changes to the original, so I’ll take some credit! I subbed white whole wheat flour for all purpose, coconut oil for canola, and raw granulated sugar for brown. 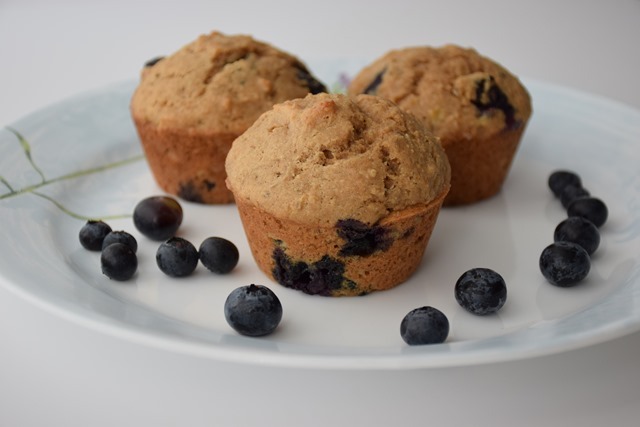 What you ultimately end up with are light, slightly sweet muffins bursting with juicy blueberries. Muffins that would be perfect with your morning cup of coffee! And because they are made with real/wholesome ingredients, there’s no guilt when you decide to eat two instead of one! Preheat the oven to 350 degrees. Spray the muffin tins with cooking spray. In a medium bowl, whisk together the flour, baking soda, salt, baking powder, and cinnamon. In a separate bowl, whisk together the sugar, oil, Greek yogurt, eggs, mashed bananas, and vanilla until blended. Add the dry ingredients to the wet ingredients and ix together just until combined. Do not over mix. Slowly fold in the blueberries. Spoon the batter (~1/4 cup) into the muffin tins and bake for 18-20 minutes. The muffins should appear golden brown in color. Weekend Recap – Spring Has Sprung! Gorgeous photos & crazily delicious recipe- love blueberry muffins…so excited for berry season to start so I can bake my heart out! Definitely bookmarking this recipe to try when I get to London- a box of (imported) blueberries here cost about $18 which is just crazy! As for my favourite muffin, that’s like asking to pick my fave kid (if I had one)- would be a toss up between blueberry, apple cinnamon, and banana walnut…lemon & poppyseed is up there too! Thanks, K! And $18!? That’s nuts! And you now have me craving apple cinnamon muffins! way to leave me craving muffins now! Loving the pictures too, P! Thanks! That means a lot coming from you! Yummmooooo!! 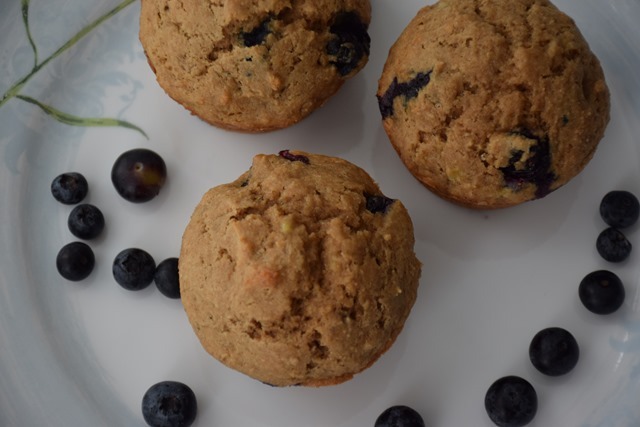 Love blueberry muffins and this one looks quite healthy!! Delicious AND healthy! I think your girls would like them too! I definitely would have loved some of these with my morning coffee today! 🙂 And I’m glad you treated your self with a pedi too… love the color! If you love blueberries, you’d love these! I JUST went to a blueberry farm, so your timing is perfect. Blueberry muffins are my favorite, with banana nut in second. Pragati // Simple Medicine recently posted…Is Fruit Sugar Healthy? Banana walnut muffins are so good! The best part of this recipe (I think) is that you can tweak a few things and make it what you want.